Hello! 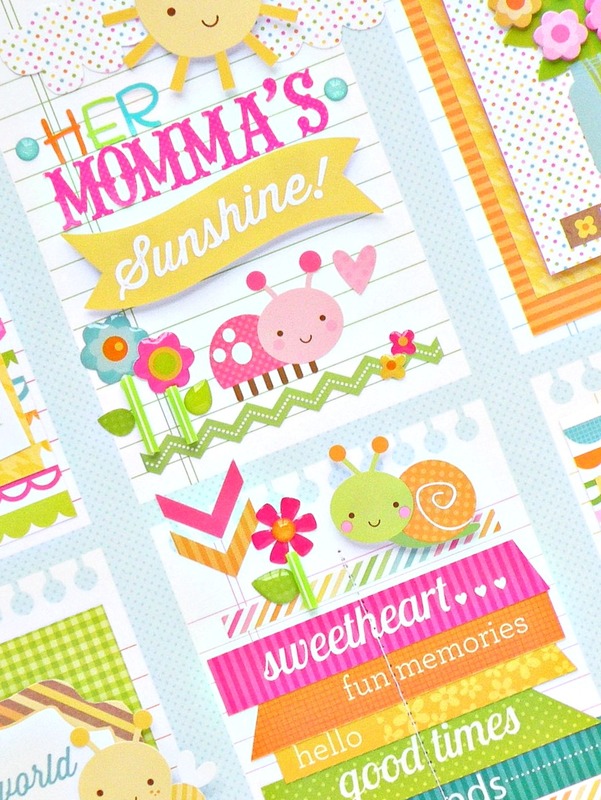 Stephanie here today to Share my Hello Sunshine Layout with you today. There are layouts that are just so much fun to make and this was one of them. I looked at all the patterns in this collection to choose from and the Bright Blossoms paper stood out immediately. I really like the grid design of the sheets of note book paper because I knew that they would allow me to create 6 different "scenes" on one layout. I really like layouts that are symmetrical and a grid design almost always provides just that. I like how they off so many opportunities to play with and add many more different embellishments than I usually would to a page. 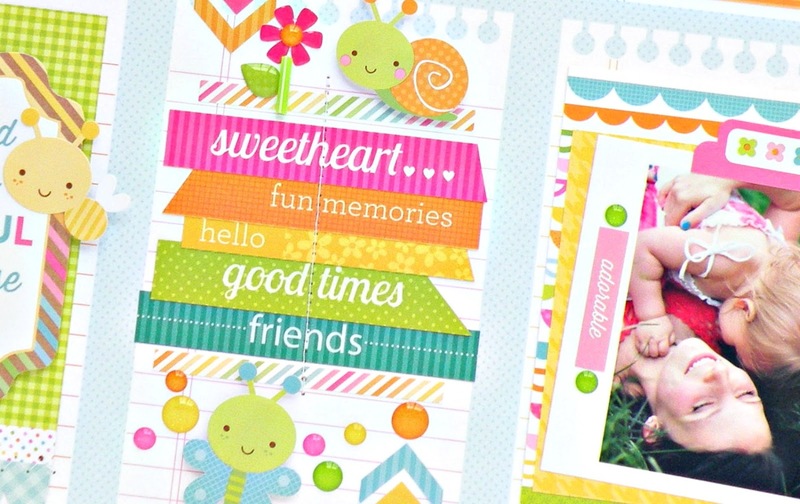 I mostly stuck to the Hello Sunshine collection for this one but also added in a Simply Put card insert from the Kraft in Color collection. I cut out the sayings that were in strips and used the ones in coordinating colors. The words were perfect. For each scene I just played around piecing together different pieces from the collection to make them each unique. I dded in a few other things like Doodletwine, a mini clothespin and paper clip to add some other interest. The pictures of my niece and her mom were made for this layout, I love how they're laying in the fresh grass enjoying a few moments together. Thank you for coming by today, we always appreciate when you visit us here on the blog. This is the sweetest layout, Stephanie! I love it!!!! This is so sweet Stephanie!!! This is wonderful, beautiful, sweet, precious and I could go on and on if I had enough words!!!! This just made my heart happy and I love the colors - the layout design and just the ultimate cuteness of the WHOLE THING!!!! So well done - hope you are having an AMAZING day!!! Love it !!! But then I love everything you create! AWWWW Your LO is just as cute as can be....and your little one is so beautiful and precious. You sure did one outstanding creative job and the colors are just so pretty and definitely fit the personality of your little girl....birght, cheery and fun!! I'm a die hard scrapper since 2004 and love to see how others scrap and girl you are one super talented scrapper. TFS!! YOU ROCK!! SO MUCH LOVE in your photos Stephanie and SO MUCH TO LOVE in your ADORABLE layout!! !